Usually when I think of Pop-tarts I think of a flavorless, cardboard crust and a painfully sweet filling. Oh… and sprinkles. These have a decadent, buttery crust, a mild jam filling and no sprinkles. 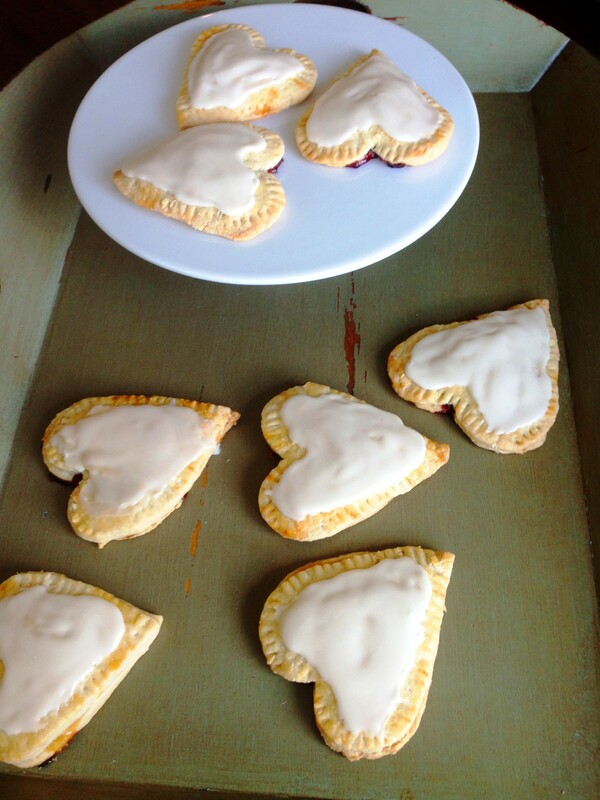 So are these truly Pop-tarts or are they more like hand pies? Does it matter? 2+2= 4 and if you saw one of these “Pop-tarts” you would eat it. *Since this treat is mainly crust you want to use good butter. I used an Irish butter. In theory you could buy pre-made pie crust and use that for this recipe. Then you are essentially shmearing jam on something pre-made and that doesn’t feel very special now does it? Dice the butter and return it to the refrigerator while you prepare the flour mixture. Place the flour, salt, and sugar in the bowl of a food processor fitted with a steel blade and pulse to mix. Add the cold butter and shortening. This was a nightmare for me because my food processor suddenly stopped working and, knowing the importance of the butter/shortening being cold, I went into a full panic. It took minutes to get the situation under control. It was terrible. Terrible. Pulse 8 to 12 times, until the butter is the size of peas. With the machine running, pour the ice water down the feed tube and pulse the machine until the dough begins to form a ball. This is another moment when my machine stopped working and all of a sudden I had a pile of ice water in my dough. Terrible. Dump out dough on a floured board and roll into a ball. Wrap in plastic wrap and refrigerate for 60 minutes. Cut the dough in half. Roll each piece on a well-floured board into a circle. 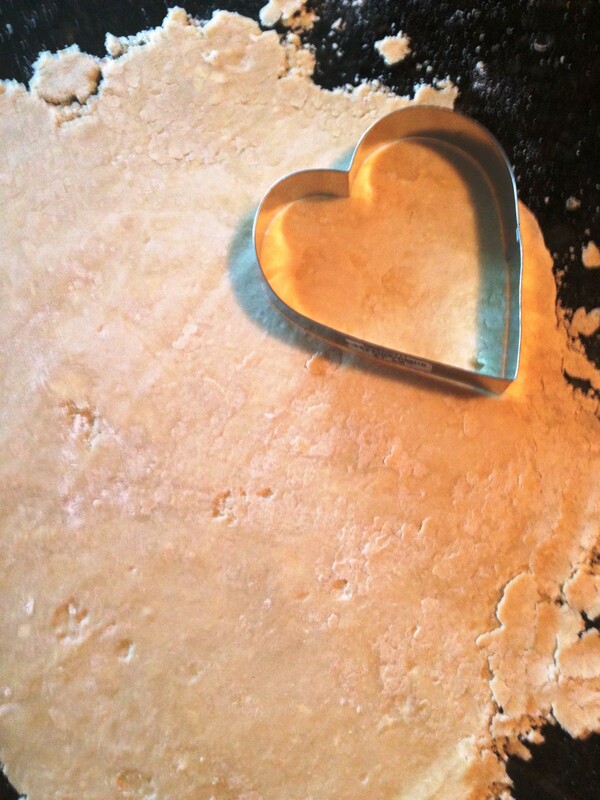 Cut out your dough using a heart shaped cookie cutter (or if you’re not feeling very lovey whatever shape you want). You’ll need two for each Pop-tart (math). My dough was a little hard to work with because I did not let it chill long enough. To be honest, you could probably roll your dough a lot thinner if you let it chill longer. This would result in a higher yield and a crispier outcome. 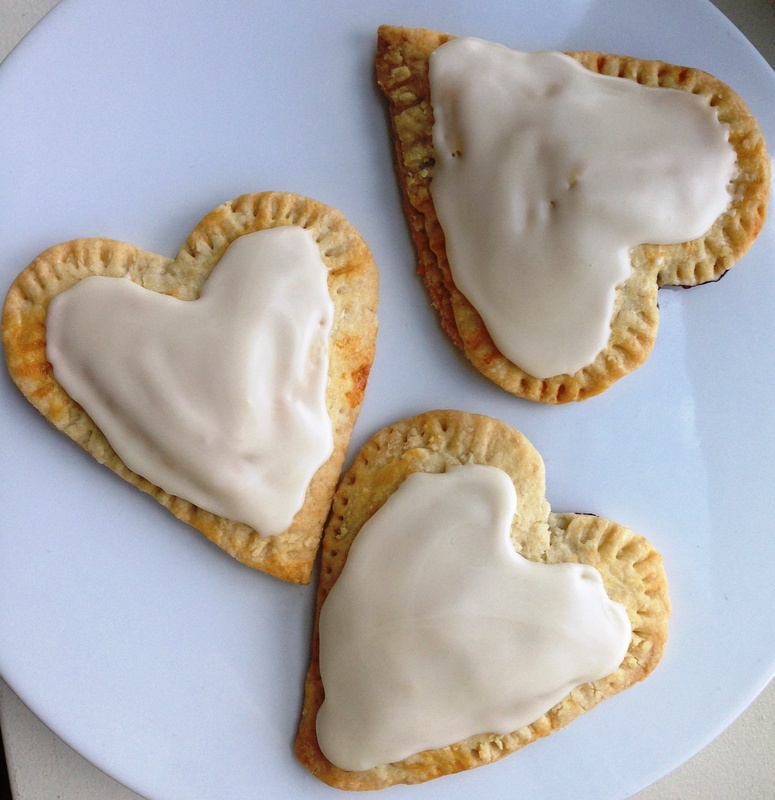 But who has time for that when it’s standing between you and a homemade Pop-tart? 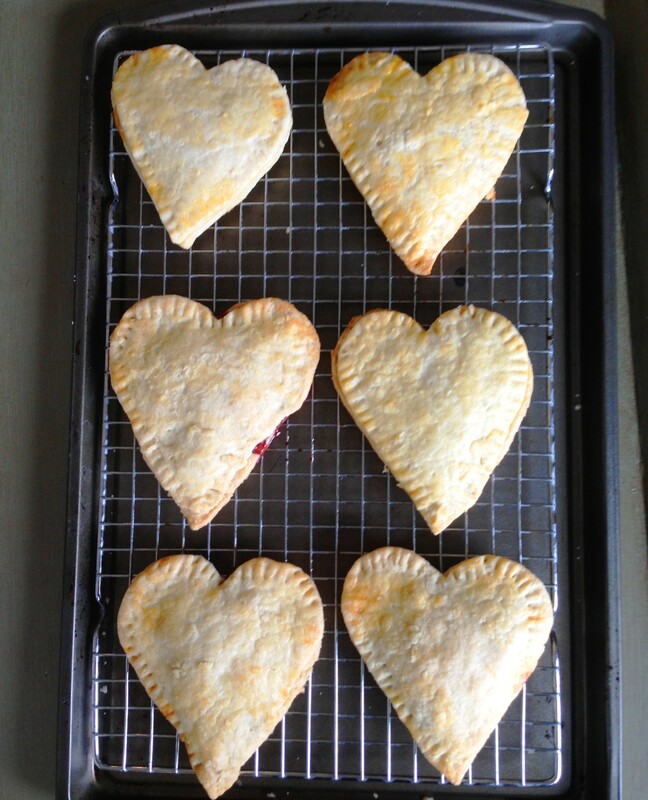 Place half of your hearts onto parchment paper on baking sheet. Place 2-3 teaspoons of filling on the hearts. Top with a matching heart. Using a fork, seal the edges. Combine egg and water. Brush Pop-tarts with a layer of the egg wash. I wish I had been more aggressive in my application. Bake for 12-15 minutes until golden. Let cool on wire rack. Meanwhile, mix powdered sugar, milk and vanilla. 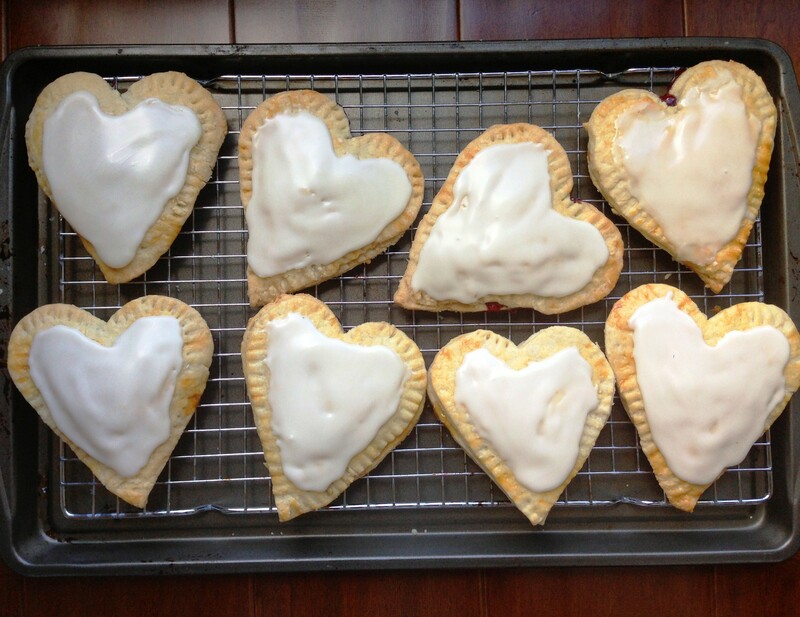 Ice your tarts. You could add sprinkles at this time. I struggle with sprinkles because, while they look cute, they are predominantly artificially colored wax. I had some little white ones I had decided to use after much debate but let my icing get too hard before applying. So if you want to sprinkle your tarts be swift.